New Delhi, :If re-elected to power in Uttarakhand, BJP will encourage the production of filtered Gau Mootra (cow urine) in the state, says a rather ambitious party manifesto. Among a host of promises on the ‘development’ front, the staple of each poll manifesto, BJP also has promises related to cow, ranging from utilisation of the animal’s products for medicinal purposes to provision of shelters for ageing and sick cattles. “Cow urine also helps produce medicines for the treatment of eye and ear diseases.” The urine can also be dried to produce tablets, Gehlot said, adding yoga guru Baba Ramdev in Uttarakhand and Kamal Kishore Nagar in Madhya Pradesh have made medicines from cow urine. The uses, apparently, are not restricted to humans alone, but will widely benefit agriculture and environment. “The liquid (derived from filtered cow urine) can be used as a fertiliser. It does not harm soil like the fertilisers having strong chemicals,” Gehlot said. 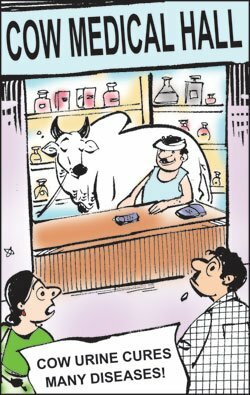 BJP’s ideological mentor RSS has been promoting ‘scientific’ experiments on the five cow products (Panchgavya), including urine and dung, exploring everything from medicinal properties to making a cola from cow urine and endorsing cow urine as a fertiliser, thereby improving soil fertility as well as increasing farmers’ income. Days ago, the BJP’s central cow development cell had taken offence at the media calling the Madhya Pradesh government’s cow–related initiatives “superstitious”. It appears that BJP would like to adopt ‘Morajin’ policy, so promissimg cow urine to voters. Let BJP purify itself with cow urine.